Sermon preached on Matthew 5:17-20 by Rev. 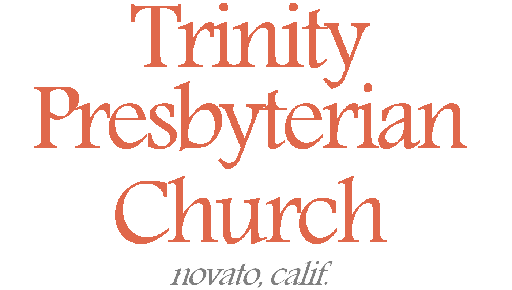 W. Reid Hankins during the Morning Worship Service at Trinity Presbyterian Church (OPC) on 3/30/2014 in Novato, CA. We now are getting into the heart of the sermon on the mount. After the opening beatitudes and a call to be salt and light in this earth, we come to find Jesus talk in great detail on the righteousness that belongs to his kingdom. And he begins this discussion with a rather bold affirmation of the Old Testament. As Jesus had begun his public ministry, no doubt some people misunderstood him. Surely questions began to arise over how committed he was or was not to what we know as the Old Testament. For them, their Bible only consisted of what we call the Old Testament, of course. When people saw Jesus hanging out with sinners and tax collectors, some might have wondered about his own commitment to righteousness. Or when people saw him repeatedly critique the scribes and the Pharisees, again, people might have wondered about his perspective of the Law and the Prophets. Remember, the scribes and the Pharisees were generally thought of as the theologically conservative group of their day. They were seen as zealous for the law and the prophets. For Jesus to criticize them, might have made some people wonder about what Jesus though about the Scriptures. If Jesus criticized the Pharisees so much, and they supposedly held the Scriptures dear to their heart, what does that say about Jesus’ perspective on the Scriptures. Is Jesus here to introduce some new novel teachings? Is Jesus trying to displace the Scriptures with something new? Well, no, Jesus was not. Jesus here in these verses categorically denies this. If there were in fact any concerns about Jesus’ view on the law and the prophets because of how he criticized the scribes and the Pharisees, it was because people didn’t understand his criticism of them. Verse 20 gives us this clarification. It’s not that Jesus didn’t like the scribes and Pharisee’s appeal to the law and the prophets. It’s that whatever righteousness they thought they derived from them was insufficient. At least for Christ’s kingdom. Again, notice the authority of Christ. Christ is coming and announcing his kingdom. And if you want to be in the kingdom, you will need a righteousness better than that of the scribes and Pharisees. As much as they would have appealed to their keeping of the law, Jesus says their righteousness falls short of his kingdom. It’s not good enough. So Jesus categorically denies that he came to get rid of the law and the prophets. But Jesus does clarify then his perspective on the law and the prophets. First, his authoritative interpretation of the law and the prophets is a much more demanding view that what the Pharisees and scribes espoused. We will see Jesus develop that a lot more in this sermon, especially in this chapter. Second, Jesus didn’t just come to not abolish the law and prophets; but he also came to fulfill them. And that is a key point. That will especially be a topic we consider today — how Jesus fulfills these. So then, we’ll tackle this today in roughly two main points. First, we’ll consider what Jesus meant by saying that he didn’t come to destroy the law or the prophets. Second, we’ll think about what it means for him to fulfill them. Two points then: First, he didn’t come to destroy; second, he did come to fulfill. So then, let’s begin with the first point. Jesus did not come to destroy the law or the prophets. Let’s start by clarifying the scope here. The Jews divided up the Bible into three main parts, the Law, the Prophets, and the Writings. The Law contained the first five books of the Bible. The Prophets include most of what we refer to as the major and minor prophets and several of the historical books. The rest, such as Psalms and Proverbs, were in the Writings section. And so for Jesus to talk about the Law and the Prophets, he had more than two thirds of what we call the Old Testament in mind. That being said, it seems that often the twin labels of Law and the Prophets were used as a more general shorthand for the Hebrew Scriptures as a whole. Passages like Matthew 22:40, Luke 16:16, Romans 3:21, are a few such passages that seem to use them in a very broad way. So, at a bare minimum, Jesus refers to a large majority of the Old Testament here, though likely he has in mind all of it. For simplicity, I will refer to this as simply these Old Testament scriptures, in our sermon today. So then, Jesus did not come to destroy these Old Testament scriptures. In other words, he didn’t come to abolish or it or do away with it. In other words, nothing of his ministry should be understood to invalidate or contradict the law or the prophets. Verse 19 helps to explain this further. Verse 19, “Whoever therefore breaks one of the least of these commandments, and teaches men so, shall be called least in the kingdom of heaven; but whoever does and teaches them, he shall be called great in the kingdom of heaven.” And so there it mentions the ongoing importance to teach these Old Testament Scriptures and to obey the commands given in them. To further drive home this point that he doesn’t want these Scriptures destroyed, he even mentions the complete scope of this in verse 18. Not even one jot or tittle should be lost. Literally, in the original, not an iota or a keraia. An iota is the smallest letter in the Greek alphabet — similar to the letter “I” in our alphabet. A keraia is the little hooks on certain letters, somewhat like the lines that distinguish today between a serif and sans-serif font. Jesus uses this as analogy. Jesus says we can’t lose a single tiny letter, or even a tiny look hook on the end of a letter, from these Scriptures. Every single part of them is important. He didn’t come to destroy any of it. It’s like what Jesus says in John 10:35; he said that Scripture is the Word of God, and that it cannot be broken. Notice how this all fits into his teaching on the kingdom of heaven. Remember, we’ve said that this sermon on the mount is about the kingdom. As he talks today about the enduring nature of what we call the Old Testament, he says it’s connected with his new teaching on the kingdom of heaven. Verses 19 and 20 both talk about this kingdom that he came to announce. His point in verse 19 with regard to these Old Testament scriptures is that to abolish them is to be least in his kingdom; and to uphold them is to be great in his kingdom. And so as much as Jesus has come with this new teaching about the kingdom, this new teaching is connected with the old. As we will continue to see, its foundation is in the old, and that’s a central reason for its abiding validity even now with the inauguration of Christ’s kingdom. So then, the Old Testament scriptures have not been abolished with the coming of Christ. They are still meaningful, and valid. We still need to teach from them. They still have commands for us to observe. We aren’t to throw out any of it! Not even the smallest part. It’s all for us! A rich heritage of divine revelation that has bearing upon us who have come into Christ’s kingdom. It wasn’t just helpful for the saints of old, but even now for us who belong to this kingdom which Christ came to announce. That all being said, let me add an important clarification. For Jesus to make this bold pronouncement, doesn’t mean we disregard all the rules of proper interpretation and application. For Jesus to broadly affirm the complete enduring nature of the Old Testament Scriptures is not the same as saying that everything applies to us in the same way, or that even every command given in those Scriptures are commands given to all people at all times. For example, God commanded the Israelites to wage a war of conquest on certain nations in the Promised Land. That is not a command he gave to all people at all times and places. We read such in the right context and employ simple rules of interpretation and application to come to that conclusion. What God did in the conquest of Canaan, and the lessons and import of it, has an abiding significance, and has great ramifications as it pertains to Christ’s kingdom. But, Jesus’ words here do not mean that the church is to look to re-conquer the land of Canaan. That would be to disregard the rules of proper interpretation and application. In the same way, then, we rightly do not believe that Christians today are bound to keep all the ceremonial laws or various judicial laws given under the Mosaic covenant. We see the fulfillment of the ceremonial laws in Christ — we’ll talk more of that in a moment. We see that many civil and judicial laws given to the specific civil government of Israel expired when that nation ceased to exist. We can learn important principles of justice from those, but we don’t see a command for all nations to be governed with those exact civil statutes. And yet, we can find throughout the Old Testament plenty of moral commands of God that are clearly timeless absolute ethical commands, applicable to all people in all circumstances at all times. We see such applications of the Old Testament affirmed in various places in the Bible. In other words, the fact that the Old Testament is not abolished and that it’s teachings and commands must be upheld, should not mean that we disregard how the Bible teaches us to rightly interpret and apply the Old Testament to Christians. Jesus only speaks a few words on this subject right here. And so other more detailed teachings elsewhere in Scripture help to clarify the import of Jesus’ few words here in these verses. So then, Jesus didn’t come to destroy, but to fulfill. Let’s turn then to our second point for today. This will further help us to begin to understand our relationship to the Old Testament scriptures. Let’s begin with a few observations then form this passage about how Jesus fulfills these. Notice then first verse 19. Jesus tells us a purpose of his in coming to earth. Not only did he not come to destroy these scriptures. He did come to fulfill them. You see, when Jesus came there were really three things he could have done with regards to these scriptures. He could have come to destroy them. He could have come to do nothing with them; just leave them be. Or he could have come to fulfill them. And that is exactly what he came to do. We are told that this was a key purpose of Jesus in coming. That’s his intention with regard to the law and the prophets. He came to see to their fulfillment. Verse 18 explains this fulfilling further. He says that none of these Scriptures will pass away, but then adds two qualifications. Until heaven and earth pass away. And until all is fulfilled. When you hear about heaven and earth passing away, you should remember that in the age to come, there will be a new heaven and a near earth. So that makes us think about how what is held out in the law and the prophets, at least some of it, won’t come to its fulfillment until then. But the other qualification tells us that what we should really be looking for is the fulfillment of these Scriptures. Some, many of them, have already found their fulfillment. Some have not yet find their fulfillment. But the point of verse 18 is to assure us that these Scriptures will be fulfilled; they will be accomplished. What is held out or promised will come to pass. That is in fact what Jesus has come to do. And so then, how does Jesus specifically fulfill these Old Testament Scriptures? Well, that too is not a simple thing to answer, because there are several ways he brings fulfillment to them. That’s related to the complexity of these scriptures that we were mentioning before. Because of the complexity of their application and demand, we find different ways in which Christ brings them to fulfillment. I will highlight some of the main ways today. First, we can point out that Jesus fulfills all the promises and predictions specifically given for a Messiah in the Old Testament. This includes all the promises about his coming kingdom, etc. Now yes, as we’ve talked about this in previous sermons, as it pertains to his coming kingdom, we recognize how that is only partially fulfilled so far. But he will ultimately bring it to its full completion. 2 Corinthians 1:20 says that all the promises of God are yes and amen in Christ! In other words, we can think about how all the Old Testament promises were looking forward to come to a climax in Christ. A second way we can think about how Jesus brings fulfillment to the law is that that he is the fulfillment of the ceremonial laws in the old covenant. There were such laws as pertains to sacrifices. There were some that dealt with outward cleanliness. There were some that dealt with what you could and could not eat. There were some that dealt with what items were to be used in the temple worship. So many of such laws. The book of Hebrews helps us especially to see that these looked to Christ. These ceremonial laws were full of rich typology that anticipated the sacrifice of Jesus Christ, and the cleansing he brings as people eat of him by faith. He brought these so fully to fulfillment that the New Testament shows us that it would be backwards and unfitting to try to observe them now. They have come to their climax and fulfillment in Jesus. A fourth way we can think about how Jesus brings fulfillment to the law is that he lived it out perfectly. There was a principle set forth right at the start given to Adam. If you obey God perfectly you will live. If not, you will die. That idea gets reaffirmed again, at least in principle, in Leviticus 18:5, roughly stated there as “do this and live.” Paul says in Romans 10:5 that this is the principle of a righteousness earned by the law. That of course is something that Adam did not accomplish, and none of his ordinary descendents have accomplished. But there is one who has accomplished this. That’s Jesus. Jesus did this and lived. He alone has perfectly kept all the law in its entirety. He is the only human that has a perfect personal righteousness. He is everything we hoped the first Adam would be, but wasn’t. But Jesus is. Jesus fulfilled all the terms of the law, and in so doing has become like a second Adam to us. That all who put their trust in him, can have Christ as our covenant head. So that his righteous fulfillment of the law becomes accounted to us. We could go on. We could talk about all the other rich typology of various institutions and people and concepts in the Old Testament scriptures that anticipated the Christ to come. Jesus said in Luke 24 how all the Scriptures were about him. 1 Peter 1:12 says something similar, along with several other passages. But this is enough for now. Christ came to bring fulfillment to the Old Testament scriptures. He and his kingdom and the salvation he has won for us is the fulfillment of all of that. Yes, there does remain yet a few things to come to pass. His return in glory yet awaits, when he brings to final fulfillment of the promises to usher in an eternal kingdom of glory. As well as those promises to bring a final judgment on those without Christ. That too yet awaits. But don’t worry. These remaining things will come to fulfillment. Jesus assures us here in our passage for today that they will. Heaven and earth won’t even pass away before they do. Christ has come for the very purpose of their fulfillment. He has already begun to see that they are perfectly fulfilled. So then, in closing, I draw us again to the kingdom emphasis in all of this. Jesus mentions again in verse 20 the concern about how to enter the kingdom of heaven. This is what they all wanted to know! He’s announced that the kingdom is at hand. They want to know how to be a part of it. We want to know how to be a part of it. In verse 20 he shocks them by essentially telling them that the righteousness of whom they probably thought were most righteous would not be enough to grant entrance into his kingdom. Wow. That should have stunned them. Realize that in general the Pharisees were well thought of by the people in terms of their religion. So, what does this mean? If you need a righteousness that is far greater than the most conservative religious leaders of the day, how do you respond? Despair? No. Or do you just buck up and work real hard to hopefully be more righteous than these religious leaders? No, not that either. As is hinted at here, and continues to unfold in the New Testament, is that none of us will be able to fulfill the laws demands by our own labors. That means none of us would be able to have a sufficient enough righteousness according to God’s law to get ourselves into Christ’s kingdom. So, then, what the solution? It’s to look to Christ who has already fulfilled the law’s demands. For the law of the Spirit of life in Christ Jesus has made me free from the law of sin and death. For what the law could not do in that it was weak through the flesh, God did by sending His own Son in the likeness of sinful flesh, on account of sin: He condemned sin in the flesh, that the righteous requirement of the law might be fulfilled in us who do not walk according to the flesh but according to the Spirit. This is how we can enter into the kingdom. We need a righteousness better than the scribes and Pharisees. Well, we have found it in Christ. His righteousness is ours when we put our faith and trust in him as our savior and Lord. Does this then abolish God’s laws for us? That we don’t need to bother with trying to obey God’s moral commands for our lives? May it never be! Christ has told us here that such commands are not abolished. This sermon will go on to call us to really strive for true godliness. But what is fulfilled for us is the law as a way to be in a right standing before God. That’s been done. Trust in that. But we are still in a good relation to God’s laws and commands. They are our rule for life. They tell us how to live as a Christian in God’s kingdom. In the weeks ahead, we get some wonderful teaching by Jesus on that. Teaching about the radical ethics of Christ’s kingdom that on the one hand will push us time and again back to the cross, to rejoice that we are not counted righteous by our own works. But on the other hand will convey to us the perfect and glorious standard of godliness that we are to seek after with all our heart. And so as a final word, praise the Lord that we have both the Old and New Testaments. Jesus reminds us today that both are so very important. Let us not disregard the importance of what the Old Testament has to teach us. It still has significance, import, and application for us. It’s the root and foundation of our faith. It’s a record of God’s work in history to save us, and it’s a history we are to benefit from. Yet, as we said — we are not to read it in a simplistic way. Some parts will not most immediately apply to you, rather you’ll have to find their application through how you are connected to them via Christ. But they all are for us and for our good. So then, become a student of the Word, so that you can rightly handle and apply the Word of God, even the law and the prophets. Amen.